Rehoboth is my life story. Whether referring to the community-at-large or the Church, Rehoboth Baptist Church was and still is the place to play (the first year we had girls’ softball in our recreation program, I was on a team, and I played women’s soccer, which only survived one season, but at least I SURVIVED); my two sons played baseball, soccer, and football here. It was and is the place to play and worship; and it was and is the place to connect with many wonderful people. I have been so blessed to be a part of Rehoboth, its heritage, the Pastors who have preached and taught the Word of God, and the experience through yesteryear, today, and tomorrow that has influenced and continues to influence my life–and, hopefully, to make a difference to others. Rehoboth is family. And my family calls Rehoboth home. 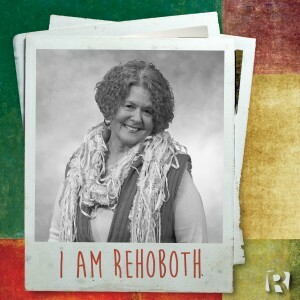 I AM REHOBOTH. Susan grew up in the settlement of Pea Ridge, which is now known as Rehoboth, and has been attending Rehoboth Baptist Church since before she was born. Growing up, her extended family made up the major portion of the congregation. Susan made a public profession of faith in Jesus and was baptized on August 19, 1959, in the old Rehoboth church building that sat up on a hill, about where the Children’s Building stands today. Susan is a retired trust officer/vice president of a major financial institution. After retiring, she began to volunteer at Rehoboth. Susan currently works part-time in the Welcome Center, serves in the Café on Sunday mornings (with, in her words, “some of the greatest volunteers and friends ever”), assists in coordinating rental and community events, sings in the choir, and volunteers at church-wide events. She is always ready to step in where she’s needed, and she does so with a smile on her face!